ST. GEORGE — Construction has begun on a new St. George overpass which, when completed, will allow traffic from Bluff Street to pass over Red Hills Parkway uninterrupted. Work on the “fly-over” officially began in April and is expected to cost $15.2 million. The project’s specific end date is Nov. 17, although traffic could be flowing a month prior to that. The new interchange will function much like it does now except the northbound and southbound through-traffic on Bluff Street will no longer need to stop, as it will be able to “fly-over” Red Hills Parkway uninterrupted on two adjacent overpasses, Utah Department of Transportation region 4 spokesperson Kevin Kitchen said. Approximately $8.9 million of the $15.2 million project, which includes construction and engineering, is state funded while $6.3 million is federally funded. The overpass was initially championed by the City of St. George, since Red Hills Parkway is a city street. 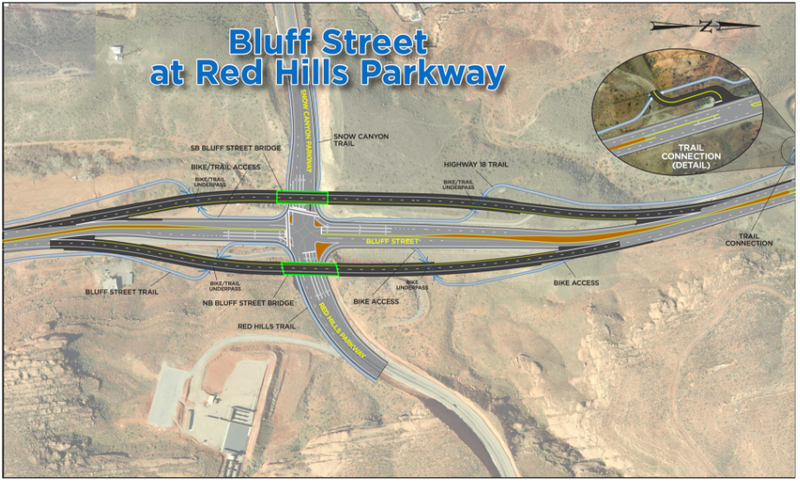 Eventually, state of Utah entity UDOT adopted the project because of its effect on Bluff Street, which is officially a state-owned road designated as State Route 18. Red Hills Parkway itself, as well as this intersection, is key to the city of St. George’s growth plan, Kitchen said. Currently, crews have squeezed down traffic lanes and are excavating slope and rock materials, building large columns to support the overpass, installing storm drain pipes – the tallest of which are over 5 feet tall – and installing a mechanically stabilized earth wall. Vehicle drivers in the area should expect congestion and delays. Cyclists, hikers and recreationalists should use caution and expect dust and construction noise around the intersection, which is adjacent to the Chuckwalla Trailhead area. The paved biking trail on the west side of Bluff Street, between the Chuckwalla trailhead and the Red Cliffs intersection, has been redirected onto the roadway with construction barrels between the path and vehicle traffic. All construction work will take place Monday-Saturday during daylight hours. However, work will halt for the Memorial Day weekend holiday from noon on Friday to midnight on Monday. This overpass is not technically part of the overhaul “Bluff Street to Red Hills Parkway corridor project” slated to begin in January 2015. However, it is on the very north boundary of this project. The Bluff Street project – recently approved by the Federal Highway Administration – will include two intersection overhauls, one at Sunset Boulevard and the other at St. George Boulevard. The project will also include a widening of a section of Bluff Street between St. George Boulevard and 500 North. Although this project has been approved, final designs have not been made, Kitchen said. 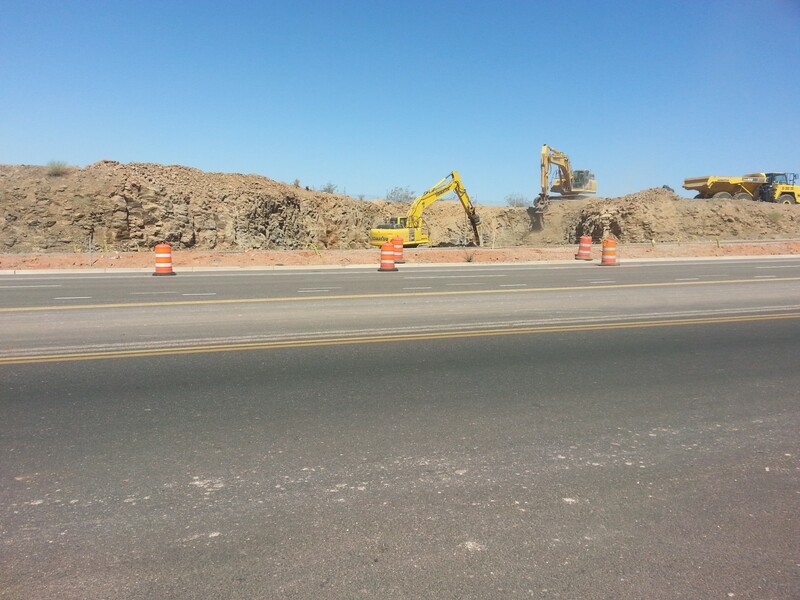 However, funding has recently come in for both the intersection overhauls. Read our previous report on the Bluff Street corridor and other road projects here. Check back for more updates on this project. What a waste of Tax Payers Money!!!! If you drove through this intersection everyday you’d feel differently. I know a dozen people that have been in big accidents there. They happen all the time. I don’t know if people have been killed there, but if not I’d be surprised, and it was bound to happen (or happen again). Yes, this is an odd, expensive design, but I don’t know how else you’d do it. I was very pleased when I saw it (once I looked it over and saw what they were doing). One project will include “widening of Bluff between SG Blvd and 500 North”, that sounds like creating a bottleneck to me! 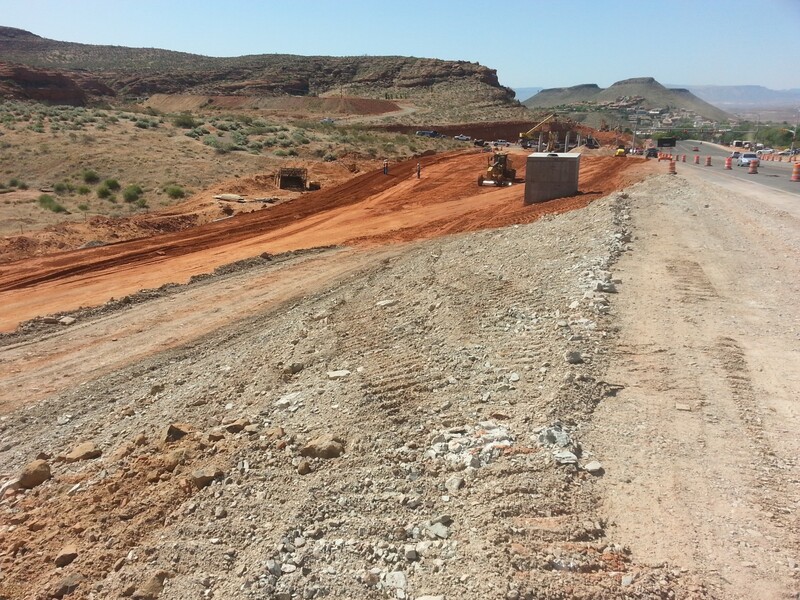 UDOT really has a greedy grasp on the city of St George! The city should’ve been pro active and built tunnels through both the east and west black hills prior to all the development east of the east black hill and west of the west hill. St George Blvd could have been one constant thoroughfare running through the center of the valley from Santa Clara to Washington and beyond. That would have eliminated the grid layout issues, specifically east-west corridors ten fold, basically eliminating the existence of present day Bluff, River Rd, Sunset and Red Cliffs. Lol, you mean the diverging diamond? I’m concerned that a vehicle traveling east from Snow Canyon parkway and turning north onto Bluff will not be able to see on-coming traffic from west-bound RedHills due to the mass and location of the northbound overpass. The approaching cars are coming down the hill. They will be hidden by the overpass. I predict lots of left-turn-failure-to-yield accidents. There was a good friend of mine that passed away in that intersection over 20 years ago. If this overpass idea had existed than it wouldn’t have been as big a problem. I would love to see the study done to justify this! The traffic flowing north and south on Bluff/18 is no where close to the amount going east and west on Red hills/Snow Canyon. This appears to be more make busy work by UDOT!!! I’m glad to hear that I am not the only one that sees this. Increasing flow on Bluff/18 is not necessary. 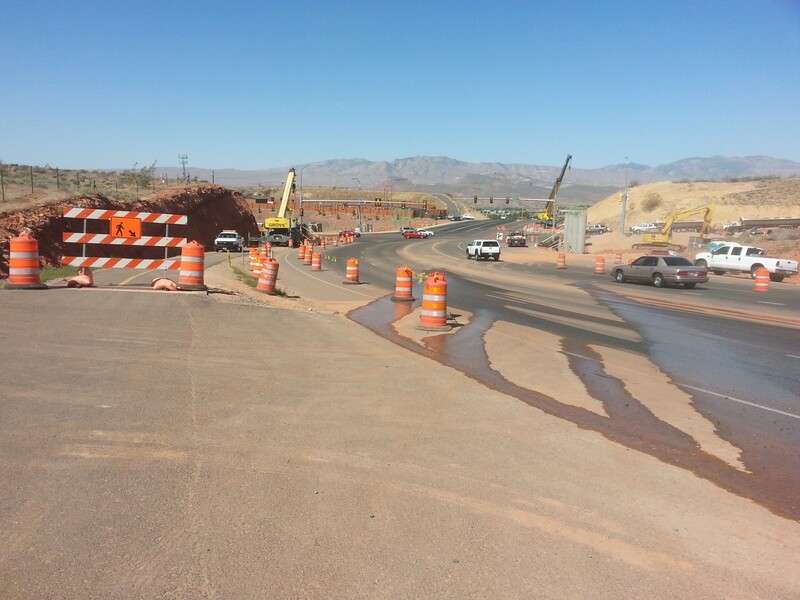 The only congestion is traffic turning left onto Snow Canyon and that was fixed when they added 2 turn lanes. Waste of money! As a resident of Ivins I see absolutely no advantage becoming as a result of this “Flyover”! I drive this intersection every day to and from work. The only issue I’ve seen at this intersection is northbound on Bluff making a left turn onto Snow Canyon Parkway. During afternoon/evening drivetime the current 2 left turn lanes can and do become backed up. I cannot see how this “Flyover” might have any impact on this issue? Occasionally westbound traffic on Red Hills Parkway backs up at the traffic light as well, and once again I just don’t see how this “Flyover” might be beneficial as well? The only advantage I see to the finished product is that residents of Winchester Hills, Diamond Valley, Dammeron, Central and Pine Valley will cut their to and from commute of St. George by a minute or so! Thinking the State and Federal dollars could have been spent much more wisely! Congrats to UDOT and St. George in upgrading these intersections before they are needed. That’s the right time to do it. You don’t wait until traffic reaches failure level to do it. That’s unless you don’t think traffic is going to increase in the future. Wishful thinking for many, but it isn’t going to happen. Heck, just the population growth of the illegals under Obama is enough to justify all this.